When the baby sister turned 21, we went out to Nevada and Utah, mixing fun stuff (Las Vegas, Hoover Dam) with STWsis stuff (Zion, horseback riding but thank God, no camping). And, because it was on the way, the Valley of Fire State Park. I'm really, really hoping I knew we were jaunting around the Mojave Desert at the time. Heh. Anyway, I picked this magnet for today, because to kill some time overnight, we decided to drop by Mohegan Sun in Connecticut for some fun. I've been there before a few times, but never really looked up and noticed all the crafty beadwork glyphs and pictures the tribe created on the ceilings. Some gorgeous work up there, and of course, it was one of the first things my mother noticed the second she walked in. 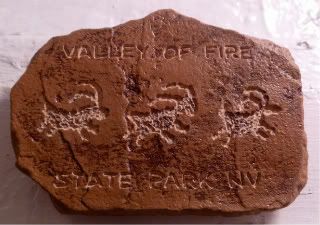 While not as old as these petroglyphs on this magnet, they were definitely just as cool.